Founded in 1978, the Healdsburg Certified Farmers’ Market is one of the original twenty-two Certified Farmers’ Markets in California. We are a mutual benefit, non-profit organization, owned and operated by the farmers and vendors of the market. Featuring a wide variety of fruits and vegetables, as well as flowers, cheeses, honey, olive oil, bread, wild fish, pasture-finished meat, and fresh eggs, the market celebrates the agricultural heritage of this beautiful area. We also have delicious cooked food, packaged food product and beautiful handmade craft. The market has several special events, for fun, and to raise awareness of seasonal produce. Don’t miss the hilarious Zucchini races, and the great Pumpkin Festival carving contests. Cooking demos, live music and more will happen as the season progresses. We hope if you live in Healdsburg you will come visit us often, and if you are in town for vacation or business, make us part of your travel plans. Come have a delicious and nutritious experience at our wonderful Farmers’ Markets! 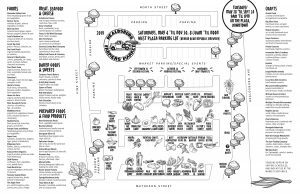 Below is our 2019 Saturday Market map. This is “almost” complete, as a few vendors added after the printing. It’s going to be a great year! Get a copy of our brochure with this map at the Information Booth!